Book a skilled lawn pro in Columbia. Backed by a total satisfaction guarantee and amazing customer support. Columbia is an outdoor enthusiast's paradise. It has plenty of gardens and parks that are ideal for biking, hiking, fishing, and walking. If you want a place that will help you get a bit closer nature, then Columbia, SC is where you need to be. There's also more than a few galleries and museums worth visiting in the city, and did we mention that it has a great theater scene as well? You could really enjoy all of these if only you didn't have to commit so much of your time towards caring for your yard during the weekend. If you want to enjoy your free time again let Lawn Love handle your yard care needs. Our independent lawn experts can handle all kinds of yard care-related chores, including lawn mowing, lawn aeration, leaf clean up and weed control. With an average of 10 years of experience in the yard care industry, these guys are among the absolute best in their field. Scheduling and setting up your yard care service is as easy as pie thanks to our easy-to-navigate website and user friendly mobile app. It will only take you a few minutes to have everything ready and is proof that we at Lawn Love are all about taking this industry to the next level. To know more about our yard care service you can call us at 803-636-2702 or ask for a quick two-minute quote. Rated 4.65 / 5 stars in 407 Columbia customer reviews. There won't be any rain in Columbia today, which means you'll probably have to water your lawn. Dusk and dawn are the best times to water your lawn (the sun will rise at 6:43 AM and set at 8:01 PM today in Columbia). 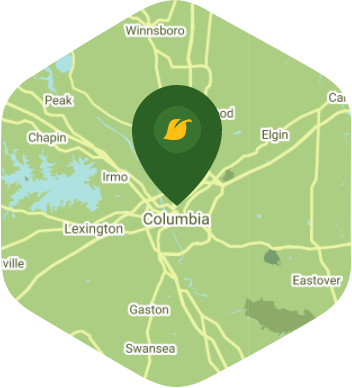 Here are some average prices for homes in Columbia. Average size of area treated 7,247 sq. ft.